Learn about how large a 3D print can be along with how element thickness, watertightness, and curved surfaces affect the quality of a print. This article discusses the size and geometric restrictions that must be considered when determining whether a 3D model is suitable for 3D Printing. These considerations apply to everyone who wants to 3D print their CAD designs, from basic mechanical components to complex architectural pieces. For a step-by-step guide on exporting your 3D models into the STL file format for 3D printing, click here. Curious about the cost of 3D printing your designs? The table below summarizes the typical build size of the most common 3D printing processes. It is important to note that for printing larger parts, industrial printer is typically required, increasing the overall cost. As an alternative, the part can be split into 2 or more parts that can be printed separately and later assembled. A guide on how to reduce to scale and split a 3D model can be found here. Often architects or game designers will produce elements in a 3D model that have an infinitesimal thickness (hair, capes, sails etc.). Thin features are impossible to 3D print unless they are larger than the minimum printable feature size for each technology. The table below summarizes the recommended minimum wall thickness for the most common 3D printing technologies. Note that in some cases, like SLA/DLP, it is possible to print smaller features, but this should be assessed in a case by case basis, after consulting with the machine operator. Every 3D model that is intended for 3D printing should be completely manifold (watertight): every edge should be connected to exactly 2 polygons and the model must include no holes. Models that are not manifold might get misinterpreted by the software that generates the instructions for the 3D printer (slicer). A non-manifold 3D model might cause inconsistent layers, holes or other errors, making the object unprintable. Non-manifold issues are often not visible at the modeling stage. The simplest way to check whether a model is printable is to use an analyzer software, like Netfabb or Meshmixer. These programs detect model features that will cause issues at the 3D printing stage and offer repair options (without impacting the overall geometry of the model). Also when you upload a part to print with 3D Hubs, our automatic tools will check whether a design is printable with the most common 3D printing processes and we will show you the areas that have errors. Most CAD modeling software, such as Solidworks and Fusion360, use Non-uniform Rational Basis Splines (NURBS) to display the surfaces of a 3D model. When exporting your model to the STL file format for 3D printing it is important that an adequate number of polygons are used to represent its surfaces. This will ensure that part will be 3D print with a smooth appearance. If the 3D model is exported with too few polygons, the edges connecting individual polygons will often be visible in the final 3D printed part. This effect is more prominent with large models (larger than 300 mm3), where the polygons become more visible on curved surfaces. If the 3D model is exported with too many polygons, then its file size will be unnecessarily big, making it difficult to handle, and will have no effect in the final quality of the printed part, as tiny details cannot be 3D printed. Luckily, most modeling software export 3D models with an adequate number of polygons using the preset, resulting in smooth 3D printed parts. If a higher polygon count is required, the export settings can be adjusted accordingly. You can slip large parts to fit in the available build area of a 3D printer. 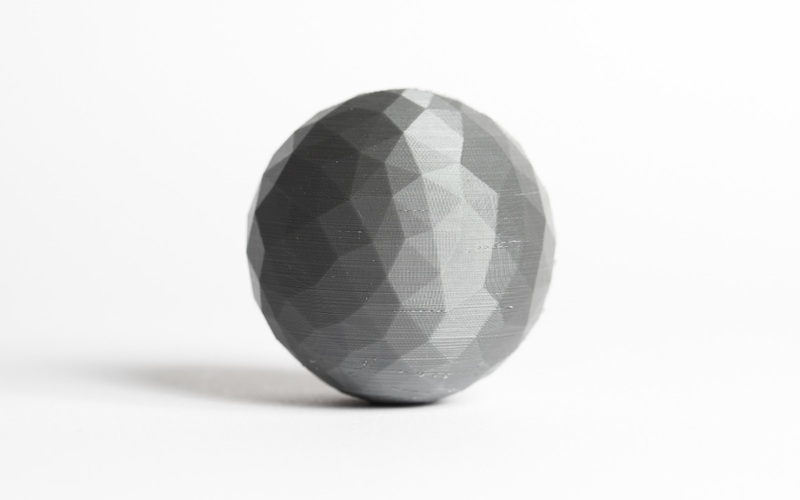 Upload your 3D models to 3D Hubs and we will check them for watertightness and printabillity. Ixi-Art's Hub – 3D Character Artist with history in Game Design. Learn what affects the price of 3D printed parts and how to make 3D printing more affordable. This article discusses the impact part orientation has on the accuracy, strength, speed and surface finish of 3D printed parts.